The Super M comes packing an impressive four full-range drivers which make use of Neodymium magnets, working alongside two passive subwoofers for powerful on-the-move bass. All six drivers are oriented in such a way that the sound is 360-degree, so you can fill any space with floor-rumbling sound - pretty potent considering the teeny form factor. “The intent of this project was to build the world's best sounding speaker that fits into the back pocket of your jeans,” says Tom Dudderidge, Chief Executive Officer at NudeAudio. The NudeAudio team went to lengths to ensure the sound quality was high, but the system wasn't confusing or awkward to use, operating under an 'anti-feature' policy. “As with any of our products, NudeAudio's “anti-feature” policy means we strip away all unnecessary features and focus our cost on the essence of the product. We want to put all the money into the acoustics,” says Peter Riering-Czekalla, NudeAudio's Chief Design Officer. It's also a hardy companion for outdoor excursions, with Super M touting ever-rugged waterproof, sandproof, and snowproof casing. The Super M runs off a high-capacity Li-Ion battery that'll keep your speaker juiced for a solid eight hours, and ships with a USB cable for easy home charging. It's a wireless device, making use of Bluetooth 3.0 connectivity, and includes speakerphone functionality for hands-free calling. NudeAudio's turned to Kickstarter for project funding, and has raised over $370,000 since its 16th July launch. With a target of $75,000, the Super M is well past funded and still has 20 days to go. 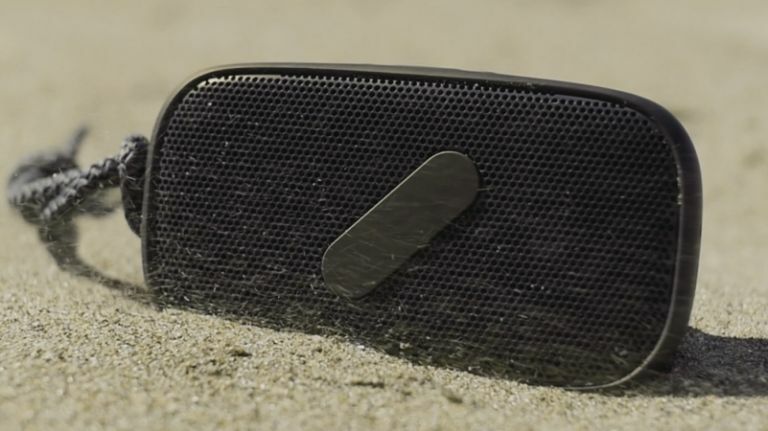 If you're keen to pick up one of these Bear Grylls style speakers to drop in your back pocket, you're looking at a price-tag of $99, which translates to just short of £60. Estimated delivery for the product is September/October this year.